An artist's conception of stars moving in the central regions of a giant elliptical galaxy that harbors a supermassive black hole. Image of the center of our Galaxy from laser-guide-star adaptive optics on the Keck Telescope. This is an HKL-band color mosaic, where H(1.8 microns) = blue, K(2.2 microns) = green, and L(3.8 microns) = red. 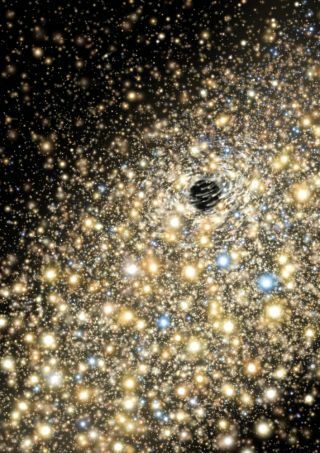 More massive black holes have larger event horizons, the region within which even light can not escape. If a ten billion solar mass black hole resided at the Galactic center, its immense event horizon would be visible (illustrated by the central black disk). The actual black hole at the Galactic center is 2500 times smaller. This figure shows the immense size of the black hole discovered in the galaxy NGC 3842. NGC 3842, shown in the background image, is the brightest galaxy in a rich cluster of galaxies. The black hole is at its center and is surrounded by stars (shown as an artist's concept in the central figure). The black hole is seven times larger than Pluto's orbit. Our solar system (inset) would be dwarfed by it.